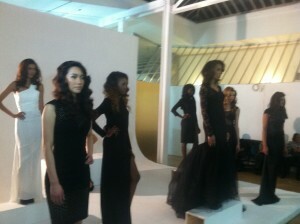 Charles Dieujuste AW13 evening wear presentation was gorgeous! In a classic black and creme palette, his dresses and gowns were a nod to old Hollywood glamour while thigh high splits channeled the femme fatale. With visions of Veronica Lake dancing in my mind, this collection marks Charles as one to watch! Charles Dieujuste partnered with Community to Community to bring clean, portable water to Petit Goave, Haiti. With such noble endeavors, fashion has never looked better!